This very interesting late medieval surname is of both English and French (Huguenot) origins. It describes a particular type of soldier, a halberdier, one who carried the halberd, a weapon which is a cross between a spear and a battle-axe, and is still carried today by certain ceremonial guards, such as those of the Tower of London or the Vatican. It never found much favour with British forces, being difficult to wield in battle, expensive to produce, and requiring considerable skills, which were lacking in the volunteer armies of England. However, this was not so in the Continent, where professional armies were permanently maintained and trained, and it may be that many of the 20th Century British nameholders, although it is quite a rare name in relative numbers, owe their origins to a Huguenot ancestry, as shown in the first known recording below. 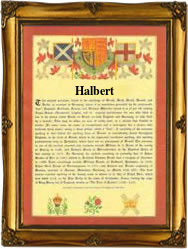 There are a number of variant spellings including: Hallbord, Halbert, Halbord, Hallbird and Halbeard; Zacarie Hellebert, being recorded at the French Huguenot Church, Leicester Fields, London, on February 16th 1698. Elizabeth, the daughter of John Halbard (wife's name not recorded), was christened at St. Dionis Back Church, London, on September 4th 1670, and Edras Halbord married Elizabeth Bowring at St. James', Duke's Place, London, on February 15th 1690. The first recorded spelling of the family name is shown to be that of Thomas Halbout, which was dated March 12th 1597, recorded at the Strangers Church, Canterbury, Kent, during the reign of Queen Elizabeth 1, known as "Good Queen Bess", 1558 - 1603. Surnames became necessary when governments introduced personal taxation. In England this was known as Poll Tax. Throughout the centuries, surnames in every country have continued to "develop" often leading to astonishing variants of the original spelling.